Now that Logan is in his "big boy" bed, he can get out of the bed in the morning and wake us. 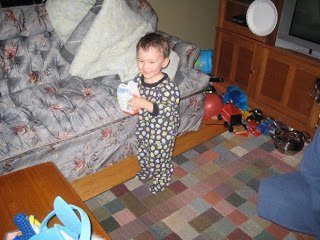 This morning we heard little footsteps running across the hallway at 7:00. He came into our room and informed us that he had a nice sleep. He also asked if we had a nice sleep. Then he pronounced that it was, "Easter Time!" So, we brought him downstairs to see if the Easter Bunny visited. Logan was very thoughtful the night before and left some of the sprinkle cookies that we made together for the Easter Bunny. I think the Easter Bunny must have liked them, because he left Logan all sorts of nummy goodies. 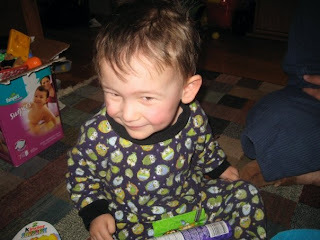 There is Logan after he found his Kinder Surprise. The Easter Bunny hid the goodies all around the living room for him to find. He found them all: Mini eggs, Kinder Surprise, A chocolate bunny and a stuffed Easter penguin that mommy helped the Easter Bunny sew. But not to worry, although Logan will be hopped up on sugar all day, at least we got him to eat a banana for breakfast first. And we're making a turkey today. Num Num! Happy Easter from Team T-Lo!